The Federation of Transvaal Women (FEDTRAW) was formed on the 8th of December 1984, bringing together close to 200 women from all over the Transvaal (now known as Gauteng). 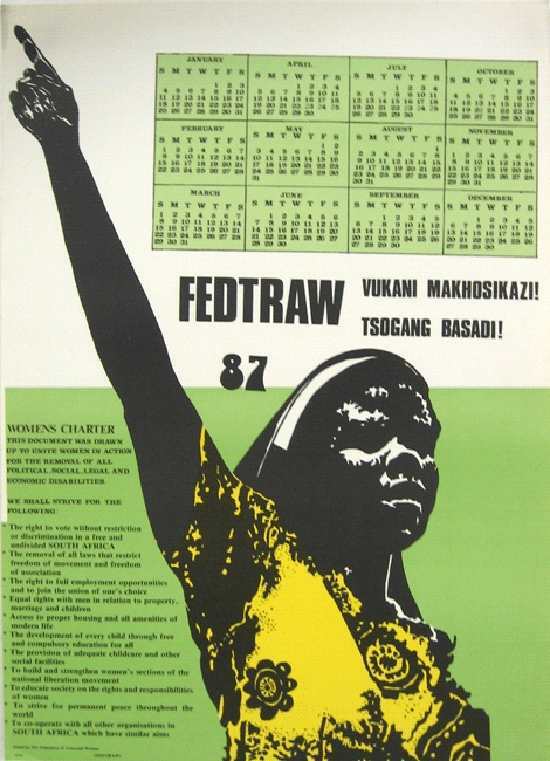 The formation of FEDTRAW was based on the celebration of the formation of its mother body Federation of South African Women (FEDSAW) and also in commemoration of Women's Day, August 9th. The federation was regarded to be a necessary link that allowed women in the Transvaal to work together on issues such as high food process. High rents, conscription of men into the army, inadequate child-care facilities and lack of time to devote to needs of the community and family. FEDTRAW also focussed on the plight of rural women and resolved to organise rural women around local issues. The federation resolved to support families of detainees, support the youth in their fight for democratic Student Representative Councils (SRCs), to fight against sexual harassment at schools, to establish women's groups where they do not exists and to popularise the Freedom Charter. The Women's charter was adopted as a working document for FEDTRAW as the demands of women at the time were the same as those made in 1955. Sister Bernard Ncube was elected as first president of the federation, Albertina Sisulu, Rita Ndzanga, Francis Baard and Maniben Sita were elected as active patrons, while Helen Joseph and Winnie Mandela were non-active patrons.